If you've purchased the TDS Podcast App for the iPhone or iPod touch, then you should be aware that there are two different types of "Extras" included. I just received mail from a listener who didn't realize that there are Extras with each individual episode as well as the standing Extras when you first launch the app. 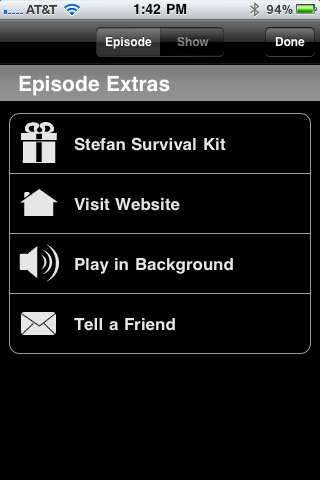 To see the "Episode Extras," click on any podcast in the list of shows. Once you have a particular show open, click on that Extras button in the upper righthand corner. That reveals a second menu. For example, this week's show, "11 Photography Goals for 2011," you have another photographer's survival kit movie (from Stefan) waiting for you in the bonus content (as shown in the illustration). I try to add a goodie at least every other show, and sometimes more often. It's all for fun. I save my serious work for the daily posts and the weekly podcasts. You'll notice that at the top of the screen for every podcast episode, there's a star that is outlined. If you tap on that star, you have the option of adding it to your starred list, and you can download the show to your iPhone. This is handy if you have bandwidth at the moment, but are concerned that you might not be able to stream the show in real time when you're ready to listen to it. Tapping the Download button puts the show right on your mobile device. When you are listening to a show, you may have noticed the "round arrow" surrounding the number 30. This allows you to jump backward 30 seconds. It's quite helpful if you miss something that I say, and you want to hear it again. Just tap the number 30, and back you go. When I add a wall paper to the Extras for a show, as I did for the "Canon EOS 60D Review" episode, it is downloaded to your Camera Roll in your Photos application. This is yours to play with as you see fit. I don't have an Android phone, but I did have a chance to look at the TDS Podcast App on an Android device, and it looked quite similar to the iPhone version. But the one omission seems to be the Extras button. I'm going to see what I can do about that. If I can add it to the app, I'll be sure to post about it. As you may have guessed, no body is getting rich off this podcast. I have ISP fees, two sys admins to help with improvements and the constant battle against spammers, and I spend a lot of time each week generating original content. I provide the podcast app as a service and as a way to generate an extra bit of revenue. For each app that is purchased, $1 goes towards supporting the show. The other 2/3rds is split between Apple and the developer of the app. But every bit helps, and I appreciate your support.